My family has a tradition of a light-hearted competition of who can find the funniest birthday card for any family birthday. My brother-in-law’s birthday was last week, so I spent a bit of time in a local card shop trying to find something that we hadn’t seen before and was truly funny. As the minutes passed and I picked up card after card, I began noticing themes of “She looks good for her age” and “If he can remember anything at this age, that’s a win.” I didn’t find any of them to be funny, and the more I thought about it, I found them all mildly offensive. If the writers of these cards were to substitute any other personal characteristic where these cards say “age” (e.g. ethnicity, religious or sexual preference, other physical attributes such as weight or hair color), there would be an outcry. These cards would be removed from the shelf immediately, and we’d likely expect a public apology from the manufacturer. So why is it okay to make fun of aging and older adults? Microaggressions are typically defined as comments or actions that unintentionally discriminate against individuals. These comments are incredibly common and pervasive in society, to the point that many people do not notice them. When one is on the receiving end of a microaggression, one commonly wonders, “Did he/ she really mean that? Did I take that the wrong way?” But nonetheless, people who are victims of a microagression feel like they have been made to feel less and feel “othered.” Being told you look good for your age is perfect example of a microaggression. This is a very common comment, and many even feel they are giving a compliment when they make these remarks. However, at the core of this statement, the messages conveyed are that it’s not okay to look old, and that there is something wrong with aging. The comment is a microaggression, and the person making the comment is acting in an ageist fashion. Ageism is not only a problem in society at large, it is also a problem in the medical and helping professions. Studies have shown that medical professionals are just as likely to have negative views of older adults as the general public (Nelson, 2005). Literature suggests that many doctors believe that aging is unstoppable, so treating illness among older adults is futile and a waste of time. Sadly, psychologists frequently have similar beliefs. Older patients are less likely to be referred for psychiatric assessment than their younger counterparts, even when presenting with the same symptoms. Drug therapies are more likely to be recommended than psychotherapy for treatment of depression because therapists often believe that older adult clients do not talk enough or talk too much (Nelson, 2005). As helping professionals, we need to bring this issue to light because roughly 4 in 10 adults will need long term health care at some point, and this need is expected to triple by 2030 (Reyna, Goodwin, & Ferrari, 2007). In relation to ageism, elder abuse is becoming an increasing problem in society. Prevalence rates of elder abuse range from 2-6% (Phelan, 2008). Some researchers suspect that this number may actually be higher, suggesting for every reported case, 5.3 cases are unreported (Phelan, 2008). In the most commonly reported cases, the victim is of the “oldest old” (age 80+), female, and the perpetrator is typically a relative (Phelan, 2008). Roughly 80% of nursing home residents are women, making women far more likely to be victims of abuse and poverty than men (Butler, 2009). Phelan (2008) cites literature that suggests that ageism contributes to apathy and ill treatment of the elderly, which can result in elder abuse. Other literature supports this claim, including a survey of emergency room physicians which found that only 25% had training on elder abuse, while 63% had training about spousal abuse, and 87% had training on child abuse (Nelson, 2005). So why is there not a larger outcry from psychologists and other helping professionals? We are very quick to raise our voices when other groups are marginalized, but we are leaving a huge portion of society out when it comes to our efforts in advancing the rights and dignity of all repressed persons, including older adults. I also know that small efforts can make a big difference, so I encourage you to speak up when you hear someone being told they look great for their age. Please suggest that they just look great, period. And, please be more selective when you purchase birthday cards. By the way, I selected a card with a bacon-fart joke for my brother-in-law, and everyone found it funny. Butler, R. N. (2009). 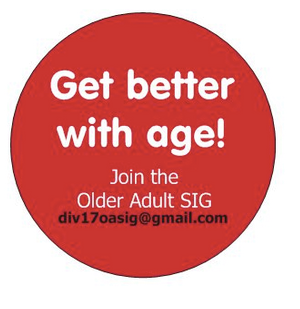 Combating ageism. International Psychogeriatrics, 21 (2), 211. DOI: 10.1017/S104161020800731X. Nelson, T. D. (2005). Ageism: Prejudice against our feared future self. Journal of Social Issues, 61 (2), 207-221. Phelan, A. (2008). Elder abuse, ageism, human rights and citizenship: Implications for nursing discourse. Nursing Inquiry, 15 (4), 320-329. DOI: 10.1111/j.1440-1800.2008.00423.x. Reyna, C., Goodwin, E. J., & Ferrari, J. R. (2007). Older adult stereotypes among care providers in residential care facilities. Journal of Gerontological Nursing, 33 (2), 50-55. Kelly Martincin is an integrated behavioral health psychology intern at the Hampton VAMC in Hampton, Virginia. She received her master’s and doctoral training at Cleveland State University, and her undergraduate education from Ohio Dominican University. Kelly is looking forward to her post-doctoral fellowship at the Cleveland Clinic Chronic Pain Rehabilitation Program for the 2015-2016 year. She currently serves as the Div. 17 OA SIG Membership Coordinator, and previously served as student representative for this group. This entry was posted in Uncategorized on March 9, 2015 by div17oasig. Reblogged this on Psychology Benefits Society.